Just couldn’t miss out…I have one last OPAM to post for 2010….talk about cutting it fine!!!! This is my ‘repurposed’ kitchen valance….which is now my craft room valance/curtain topper! I’ve had this on the go for the past….ooooooo…dare I admit……8 years!!!!!! *ouch* I just found them in my clean up for the ‘Sew It’s Finished Challenge and thought I could get this in before the New Year…..so killed two birds with one stone really!!!!! Just need to give it a whirl through the washing machine now before I hang it up…..it’s a little bit dusty!!!!!!!! Have a fantastic New Year Celebration…….keep safe and don’t forget to go here and leave a comment before midnight tonight for your chance to win a 12 month subscription to The Quilting Pattern Magazine. Sugary hugs and may your bobbins always be full in 2011! Just squeezed that one in for 2010! I thought I was bad finishing off a quilt that only needed binding for the last 3 years! LOL We all have ghosts in the closet! Wendy it's just darling! Good for you on getting that in at the last minute! Oh so cute. Have a wonderful New Year! Oh Wendy, Looks great can not wait to see it up in the Sewing room. This could be one particular of the most beneficial blogs We have ever arrive across on this subject. Have a fantastic New Year Celebration, keep safe. 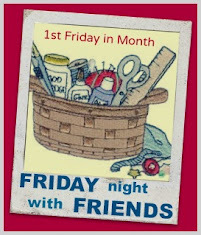 Join with Cheryll on the 1st Friday of the month for a virtual sew in. The next one is April 5th.